I have a special memory that revolves around homemade Beef Stew . . .
Way back when I was eight years old, and attending a 1-room school house (kinda like the one on "Little House on the Prairie"), my neighbor came to school to pick me up! I always rode the school bus or walked the 2 miles home, so this was quite a surprise eying picked up! Our neighbor and my teacher were whispering and smiling. When I climbed into the car that afternoon, I was told I had a new baby brother! I was expecting Momma to deliver a pony, so I was a bit dissappointed! As the news of my brother's birth was spread, family and friends began bringing food. May Blake brought a steaming pot of beef stew and homemade cupcakes. 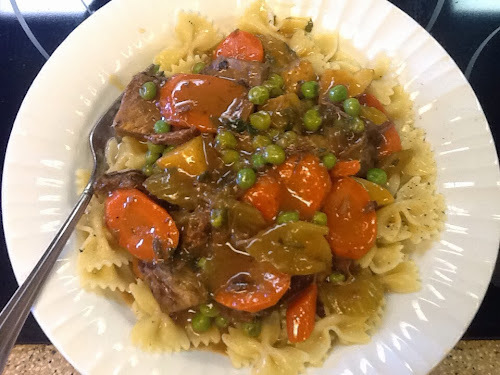 My first bite of stew . . . and I was smitten! It was pure "Comfort Food" at its best! And the cupcakes . . . rich, moist, dark chocolate liberally covered in cream cheese frosting! I was beginning to think, "This having a baby, was working out quite nicely for me!". Honestly, I could eat homemade beef stew every week, but beef prices and a husband who doesn't share my deep appreciation for stew, makes this a special treat when Will is out of town. That's fine, it just means more beef stew for me! We buy our meats when they are on sale. I began with a 4 pound tied, boneless beef cross rib roast, but any lean beef roast will do. I used my Fagor pressure cooker to expedite the cooking time, and to assure I would have a fork-tender piece of meat. Read my tip below for other easy methods of cooking a beef roast. If you want help using a pressure cooker go here. Our first meal, using the beef, was shredded beef and black bean tacos . . . Yum! I also made several roast beef sandwiches topped with thick cheddar slices, and lots of yellow mustard, served on homemade seeded buns . . . Double yum! That left me with beautiful, rich beef broth and enough meat to make a generous pot of beef stew! Our 4 pound beef roast was salted and peppered; then browned on all sides with a little olive oil, in my pressure cooker. Next, I added about 2-inches of water, a medium onion cut in wedges, 2 bay leaves, put on the lid, set the pressure cooker on 15# pressure, for 90 minutes. You could also roast the beef, with onion, bay leaves, salt and pepper in a covered pan in the oven at 350F for 3 hours (be sure to add an inch and a half of water). Or, brown your seasoned beef and slow cook it overnite in your crock pot. Put your broth in the fridge so the fat hardens; then it's easy to remove the thick waxy layer! And you thought comfort food had to be bad for you . . . Look at all those veggies! Cut cooked-tender beef into large cubes, set aside. To a large saucepan, add: beef broth, sliced carrots, celery and red potatoes; simmer until just cooked, not mushy, about 10 minutes. Meanwhile, cook your pasta in well salted, boiling water, til aldente. In a 1-cup glass measure, whisk water and flour together to form a smooth thickener. Gently add thickener to broth, whisking with care, to not damage the vegetables; simmer about 2-3 minutes. Add beef cubes, peas and parsley; stir; allowing the peas to thaw. Serve stew hot over buttered, salt and peppered pasta. I try to plan ahead when making meals. It saves me both time and money! For instance, when I bought my beef roast, I knew I was going to be using it for several meals, so I bought a large one. You could also cook up a full pound of pasta and reserve half for a pasta salad. Let's face it your time and money are valuable! Use them wisely! Veggies are simmered in a rich beef broth . . . 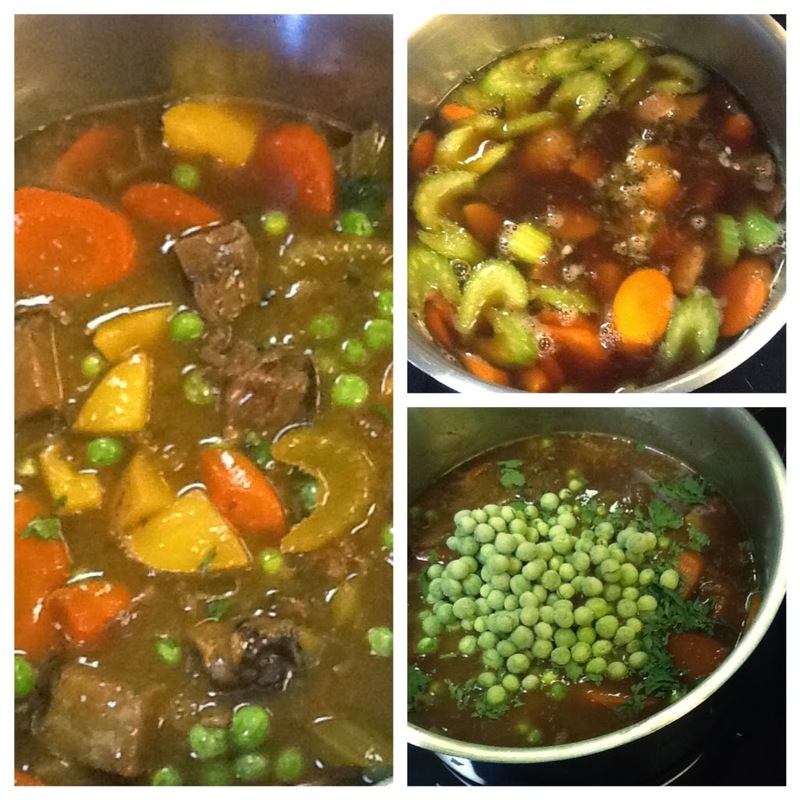 Beef, peas and parsley are added at the end so they're not overcooked and the beef doesn't fall apart. So, there you have it, another reason to look forward to Will's times away from home! Just kidding! When I really need to make a pot of beef stew, Will politely eats 1 bowl, with a piece of homemade bread slathered with butter and peanut butter! Do you have dishes you love, but your spouse doesn't? I have some beautiful, gourmet, multi-colored beets in my garden . . . Will hates beets . . . Looks like I'll be cooking up a batch this week, while he's out of town . . . Over at Julie's!! !